Packed inside the H-2A rocket scheduled to launch Thursday is a low-cost Japanese solar sail that could transform humanity's ability to reach the stars, assuming the spacecraft's tricky deployment goes as planned and scientists' theories hold up in real life. The primary objective of the launch is to deliver a $275 million mission on the way to Venus, but the 17-story rocket carries a cache of secondary payloads headlined by the $1.3 million Ikaros solar sail. Space visionaries hope solar sails will be a revolutionary propulsion system for future interplanetary and interstellar travel. Like a kite or sail riding the wind on Earth, the ultra-thin lightweight solar sail should be propelled by the nearly immeasurable pressure of sunlight. 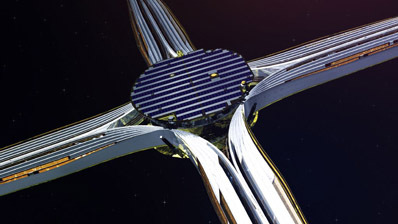 The concept involves large thin deployable structures that capture the energy of photons, particles of light that can gradually propel a spacecraft without conventional chemical fuels. Harnessing such a renewable source of energy for both electricity and propulsion will increase the efficiency of deep space missions. But sunlight is just the first step. Experts say the benefits of solar sails won't be fully realized without the help of lasers, which can concentrate light on distant spacecraft to push them faster. No space mission has ever successfully demonstrated a solar sail's ability to provide propulsion, and deployment tests in orbit have achieved only mixed results. Japan successfully unfurled a small solar sail during a brief suborbital sounding rocket launch in 2004, but a more ambitious orbital test in 2006 only partially deployed. Other solar sails developed by the United States in recent years have succumbed to launch failures. 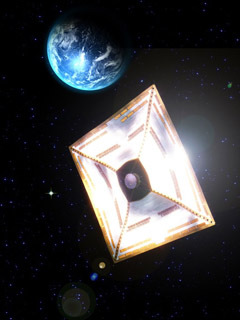 The Planetary Society, a private space advocacy organization, financed the construction of the Cosmos 1 solar sail launched in 2005, but its Russian booster failed to place the payload into orbit. NASA also built a small solar sail testbed that launched in 2008, but it was the victim of another rocket mishap. After the H-2A rocket's second stage deploys the Akatsuki orbiter during Thursday's launch, the vehicle will jettison a cone-like payload adapter to expose the 683-pound Ikaros solar sail, which is packed inside a stubby cylinder about 2.6 feet tall and 5.2 feet in diameter. The payload adapter should be cut loose about 36 minutes after liftoff, and the Ikaros spacecraft will be commanded to separate at T+plus 42 minutes, 42 seconds, according to a Japan Aerospace Exploration Agency spokesperson. Ikaros stands for the Interplanetary Kite-craft Accelerated by Radiation Of the Sun. The name also harkens to the Greek mythological figure Icarus, who fashioned feathers and attempted to escape exile but flew too close to the sun. Some time in June, Ikaros will unfurl its square solar sail membrane in a complex sequence that has proven difficult during previous orbital tests. When the drum-shaped sail container separates from the H-2A rocket, it will be put in a spin of about 5 rpm. The spin will initially keep the spacecraft under control, but the centrifugal force of the rotating capsule will force the sail membrane out of the spacecraft during the deployment. The membrane is made of polyimide resin about one-tenth the thickness of a human hair. After spinning up to 25 rpm, the membrane will be pulled out of the container with the help of small weights positioned at the four corners of the square-shaped sail. The material will be held in four arm-like packages during the first portion of the deployment sequence. One hour later, the membrane arms will be dramatically unfurled to a maximum diameter of about 66 feet. 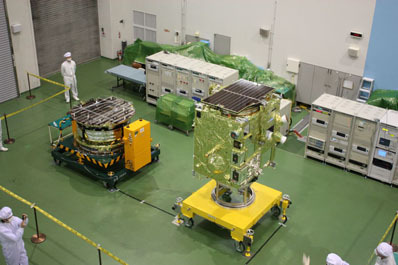 Cameras mounted to the Ikaros spacecraft will capture imagery of the deployment sequence. The solar sail will be sent on the same trajectory toward Venus as Akatsuki, which will enter orbit around the hellishly hot and toxic planet. But Ikaros will fly by Venus and continue orbiting the sun as it captures light from the sun and converts the energy into electricity and small amounts of propulsive force. Engineers tracking the spacecraft from Earth will monitor its course through the inner solar system to confirm whether it is being propelled by solar light pressure. The membrane is also lined with high-tech solar cells to produce power for the spacecraft.